A family favorite. This flavor combination is delightful. I like to add a little more fennel than listed. This book was worth it for this recipe, but there are other great ones in it too. Bring whole grains to the table in a flash. We all know that we should be eating more whole grains, an essential foundation of any healthy diet. Making this goal a reality can be a challenge, though, especially on a weeknight. 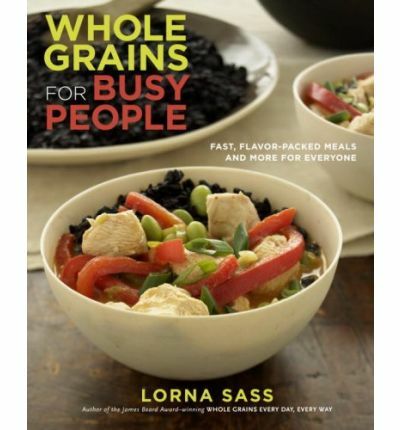 In Whole Grains for Busy People, Lorna Sass, author of the James Beard Award-winning book Whole Grains Every Day, Every Way, shows us how to do it - deliciously. Lorna shares 125 tempting recipes that focus exclusively on quick-cooking whole grains - those that take 30 minutes or less to cook - and on the array of whole-grain products that are now easily found in grocery stores, from tortillas to pastas. Boost the nutrition of any meal with tasty, flavor-packed dishes such as Oat-Crusted Turkey Cutlets with Gingered Cranberry Relish; Barley with Mushrooms, Beef, and Dill Sour Cream; and Bulgur Salad with Tuna, Olives, and Feta. Even sweets get a healthy makeover with whole-grain ingredients so that anyone can feel good about indulging in treats such as Orange-Scented Chocolate Chip Cookies, Peach Blueberry Crumble, or Chocolate Pudding Pie. Lorna guides readers through every step of cooking with whole grains, from reading the labels and selecting the best whole-grain products to using techniques that bring out the maximum flavors in the recipes. Rounded out with whole-grain quick-reference charts, advice on building a well-stocked pantry, suggestions for recipe variations, and a full-color photo insert, Whole Grains for Busy People is the only book home cooks need to make over their family's diet - without spending their entire lives in the kitchen. Lorna Sass is the author of several outstanding cookbooks. Some of her notable titles include Whole Grains Every Day, Every Way, which won a James Beard Award; Cooking Under Pressure; The New Vegan Cookbook; and Lorna Sass' Complete Vegetarian Kitchen. She lives in New York City.